Morning Meeting this past Monday was a joyful celebration of so many wonderful things our kids did over weekend. 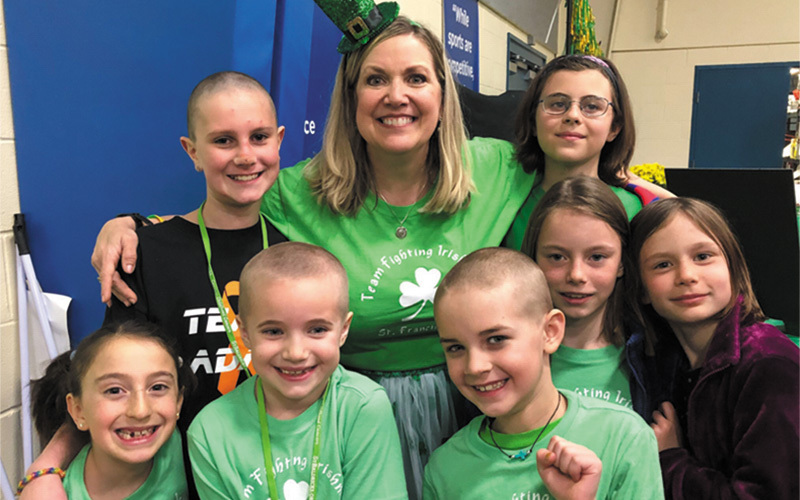 First, Joanne Brock was her usual inspirational Pied Piper, leading 19 of our Lower and Middle School students, along with PE teacher Rosanne Conlan, to shave their heads (or cut off a good deal of hair!) for the annual St. Baldrick’s campaign to raise funds to fight cancer. Together the team raised over $12,000 this year! What an act of compassion and lesson for our students. We also celebrated our 5th graders’ first-ever foray into National History Day at U of L. Billy Spalding led this new initiative where students created projects based on historical events and four of our students – Kennedy Julian, Eleanor Kayrouz, Charlie Rutherford, and Sydney Shoemaker – advance to the state competition next month in Lexington. Yet another huge accomplishment was turned in by 5th grader Andrew Snyder, who was “team St. Francis” at the Science Olympiad Regional competition coached by Jason Chlopek. Despite being our only Middle Schooler who competed, Andrew stood up to 15 other full teams and captured a second-place medal in the Road Scholar event! This is the first time in over six years that the School earned a medal for Road Scholar. And on top of all that, 55 of our kids took part in a five-hour dress rehearsal on Sunday at Old Male High School in preparation for tonight’s opening of The Sound of Music (showtimes elsewhere in the weekly!). One of the things that caught my eye was the number of kids who took part in more than one of the activities described here after their “normal” school week, complete with homework and all the hustle and bustle of modern life. It’s easy to malign today’s kids as “soft” or “always on their screens,” but when you look at what St. Francis kids chose to do with their time last weekend, I hope you are as filled with pride and awe as I am. Go, Wyverns!